Are you preparing your link and want the decoration of the event to be unique and with personality? 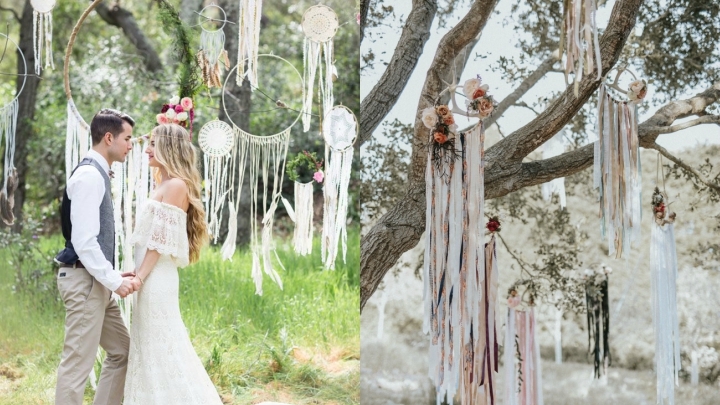 Today we are going to show you several original ideas to decorate a wedding. It is a matter of putting some imagination and thinking how you would like the place where you are going to celebrate this special day to be set. If you still do not have it very clear, keep reading and we give you some clues. Do you like dream catchers? Why not include any in the decoration of your wedding? If this is held outdoors can be beautiful hanging from a tree, for example. They are romantic and with a certain magical air. You can create a totally customized design with your own hands. You can change the feathers for tulle ribbons or for flowers, for example, or do it with the classic design that we all know. In any case, it is a decorative accessory that is amazing in the wedding decoration. 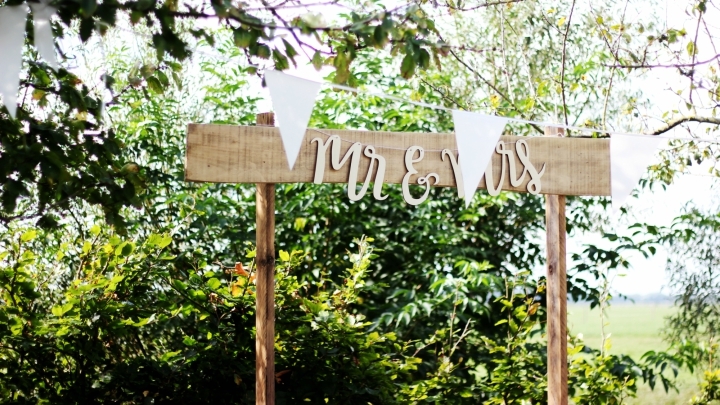 The truth is that outdoor weddings allow you to introduce very original decorative elements. If you are lucky enough to have a pond or lake nearby you can introduce flowers and candles in the water that float to add a very romantic touch to your link. 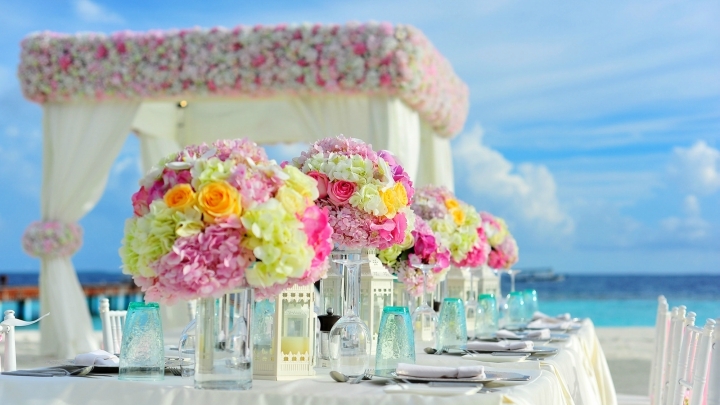 Undoubtedly, flowers are the main protagonists of the wedding decoration. There are many options for this. You can put them in the chairs where the ceremony takes place, in the tables in vases, in wicker baskets, in showers … In addition, you have the option of playing with the types of flowers and with the colors. The style you choose for your wedding can help you in your choice. Look at this colorful example. It is ideal for a wedding on the beach, for example. 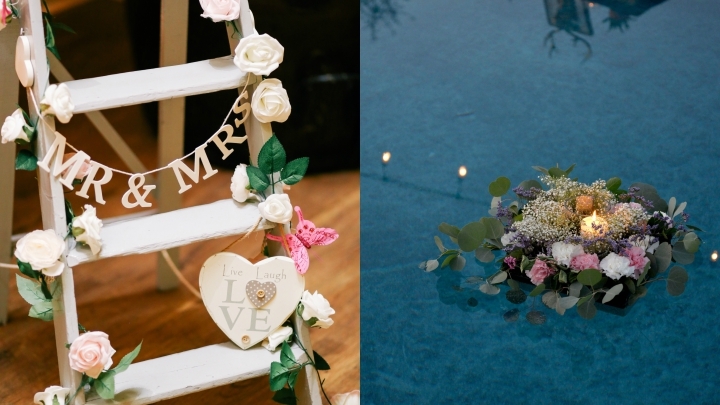 A wooden staircase, an old door, a window, a pallet … You have many elements at your disposal to give them a new decorative use at your wedding. You can dress the staircase with flowers and add a poster, or design your seating list hanging on an old wooden door, or create a nice floral corner with an old window as a backdrop. The pallets, likewise, are also excellent allies for your decoration. If you like the country style, for example, they will be great combined with wooden fruit boxes. Although the posters are almost a must have of the wedding decoration I could not remain without adding them to this list of original ideas. Originality will come, in this case, by the way you choose to place them or the phrases you write on them. Unleash your creativity and surprise your guests with witty phrases and designs.